Global automakers made ambitious forecasts Sunday of up to 65 percent sales growth in China's booming market this year - a striking contrast to the gloom in the United States and elsewhere. Sales of some models soared by up to 100 percent in the first quarter over the same period of last year, said executives speaking at the 2008 Beijing International Automotive Exhibition, which opened yesterday to the media for a preview. The show opens to the public from Tuesday to Sunday. 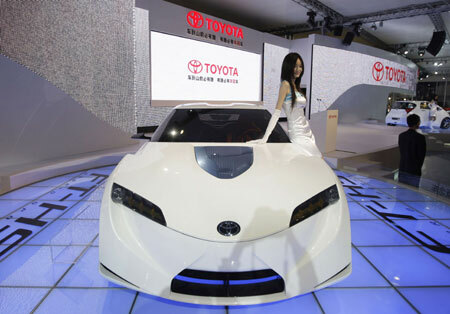 Toyota Motor Corp expects to sell 700,000 vehicles in China this year, up 40 percent from 2007, said executive Yuzo Ushiyama. Automakers are looking to China to drive sagging sales at a time when demand in the US is expected to decline this year while Europe and Japan are flat. Sales in China, already the world's No 2 vehicle market after the United States, are forecast to grow 15 to 20 percent this year, driven by a boom that saw the economy grow by 10.6 percent in the first quarter. Last year, Chinese bought 5.5 million cars, minivans and SUVs and 3 million commercial vehicles, up from just 1.6 million vehicles sold in 1997. J.D. Power and Associates says sales would grow by 1 million vehicles annually through 2015. "I think every year for some time in the future, the same thing is going to happen," said Philip Murtaugh, Chrysler's chief executive for Asia. The rivalry for a share of the market has turned the Beijing auto show into a major industry event that this year drew more than 100 Chinese and foreign automakers. Yesterday, as companies held presentations for reporters, they competed for attention with live bands, acrobats and dancers. A record 9,000 journalists, including 1,000 from abroad, were given a preview of seven models making their global debuts. Organizers expect around 600,000 visitors, including 30,000 from overseas. The biennial auto show is being held at the enlarged China International Exhibition Center, which reopened late last month at a new site on the northeast outskirts of Beijing. Altogether 892 vehicles, including 55 concept cars, will be on show in an exhibition area of 180,000 sq m, and nearly a third of them are homegrown models, organizers said. Domestic models currently have 60 percent of the new-vehicle market, but only 26 percent of the fastest-growing sedan market dominated by foreign brands. Visitors will be able to see almost 100 new cars for the first time during the show; and 24 models will make their Asia debut. About 225 overseas manufacturers and more than 1,800 domestic producers will participate in the show. Many automakers will present environmently-friendly models, including those run on alternative fuels, hybrid and electric cars, organizers said. Mercedes-Benz will display a clean diesel hybrid model, while Ford will show off its latest engine technology called EcoBoost that will deliver up to 20 percent better fuel economy on 500,000 Ford, Lincoln and Mercury vehicles annually in North America during the next five years. Some energy-saving technologies still in development will be demonstrated at the Beijing show following their appearance at other overseas shows like in Detroit in January. Luxury brands such as Bentley, Lamborghini, Bugatti, Ferrari, Maserati, Aston Martin, Porsche, Rolls-Royce and Spyker are also participating. The biennial exhibition is one of the three major auto shows in the country. The other two are staged in Shanghai once every two years since 1989 and annually in Guangzhou.